Final Deadline Extended 48 Hours! We hear all the time from many of the 500+ executives we work with here at Stage 32 that short films have become a huge part of their recruitment model when searching for new talent or ideas which can be stretched to feature length. Over the last couple of years, we’ve polled thousands of filmmakers who are members of the Stage 32 community and asked them what they most need to move the needle on their careers. Of course, the first answer was money! But the second answer was access/exposure/distribution. This, we can help with. In this DIY, control your own material world, legions of filmmakers are turning to short films to have their voices heard. Further, with more and more film festivals adding short programs into their lineups and with so many filmmakers shooting short films as proof of concept to showcase their talents, short films are finally getting the attention they deserve. We are proud to open up our call for entries for the Fourth Annual Stage 32 Short Film Contest. Last year's contest produced entries from Stage 32 members in 42 countries and resulted in a curated program of 7 incredible and well received short films (made by filmmakers from 4 countries). The short film program has been featured to critical acclaim in Variety and Indiewire. 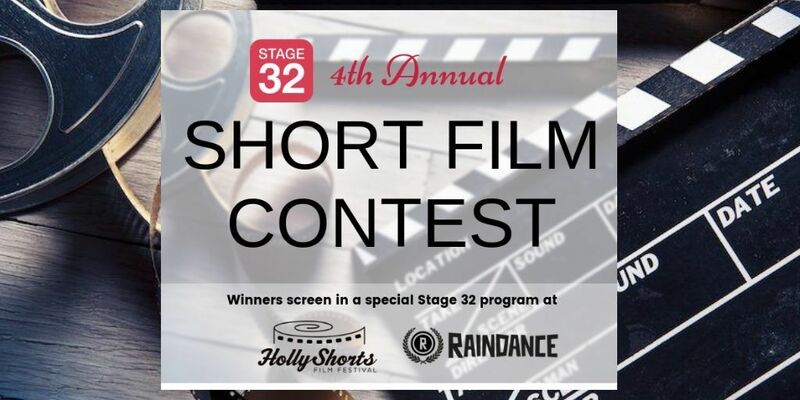 The Stage 32 Short Film Contest gives you the opportunity to show your chops and shine by providing access to some of the top executives in the business and exposure to film festival and worldwide online crowds. We wish all who enter the best of luck! The top 5-10 films will be screened in a special Stage 32 theatrical Shorts Program Showcase at the 2018 Raindance Film Festival and the Oscar-qualifying 2018 Hollyshorts Film Festival! The top 5-10 Short Films will be screened online to a worldwide audience on Stage 32 in a special global event! The top 5-10 Short Films will be placed in a special private section on Stage 32 and sent to over 500 Stage 32 executives who will be able to view the films. If there is interest we will facilitate the meetings between interested parties and the filmmakers. The grand prize winning Director will be flown to Los Angeles, CA for the Hollyshorts Film Festival or London, UK for the Raindance Film Festival and Stage 32 will host a Q&A with the Director after the film. How’s that for access and exposure? Terez has been set up on meetings internationally - with an award-winning producer in the United States, as well as with a veteran executive who is based in Budapest, Hungary. She is now meeting with Good Fear Film + Management to discuss representation in the US! Lisanne Sartor, writer & director of Six Letter Word, has taken her short as a proof of concept and finished her feature script. Through Stage 32, her film, Six Letter Word, screened at the 2017 Richmond Film Festival and the 2017 Hollyshorts Film Festival and in front of Lionsgate, Samaco Films, Whitewater Films, Kodak, Legion M and CAA. She is now directing the feature version of this film and are out to actresses to package the project! Stage 32 member Matt Kazman's film, KILLER, premiered worldwide in the Stage 32 Short Film Program at the Raindance Film Festival where Matt was featured in Variety. Through Stage 32 Matt went on to meet with The Weinstein Company and with the producer of Short Term 12. Matt's film KILLER went on to screen as an official selection at Sundance Film Festival, Atlanta Film Festival, Nashville Film Festival, IFFBoston, Florida Film Festival, Montclair Film Festival, Maryland Film Festival and the Seattle International Film Festival. Matt has gone on to work on Middle of The Night Show for MTV. Matt will be one of the judges for the final round of entries for the 2016 Stage 32 Short Film Contest. Christina Campagnola is an agent in the Independent Film Group at the Agency for the Performing Arts. Prior to working at APA, Christina worked in distribution where she managed online platforms and was at the forefront of social media marketing. Agency for the Performing Arts (APA) is the fourth largest talent agency in Los Angeles with offices in Beverly Hills, New York, and Nashville. Clients include Adam Sandler, Sam Elliot, Amy Acker, Jason Momoa, Jesse McCartney, Kim Basinger, Mena Suvari, Amy Schumer, Kevin Hart, Emily Deschanel, Louis C.K., Chevy Chase, Eva Longoria and many, many more. They've also packaged movies and television series with virtually every major network and Hollywood studio. Miranda Bailey is a prolific producer, actor and director, known for producing high quality independent films. Her passion for bringing compelling, well-crafted stories to the screen has been the driving force in her distinguished 15-year filmmaking career. Bailey has produced over 20 films, among them the Oscar-nominated THE SQUID AND THE WHALE and the Spirit Award-winning THE DIARY OF A TEENAGE GIRL as well as James Gunn’s SUPER, the Sundance hit SWISS ARMY MAN and the critically acclaimed NORMAN. Bailey’s directorial narrative feature debut YOU CAN CHOOSE YOUR FAMILY, an offbeat familiar dramedy premiered in the Spotlight Section at the 2018 SXSW Film Festival. She assembled a decorated cast including Grammy-nominated comedian, actor, writer, producer, and New York Times best-selling author Jim Gaffigan, two-time Emmy winning actress Anna Gunn, SAG-nominated Samantha Mathis and rising star Logan Miller. Ron Howard, Brian Grazer and Karen Kehela Sherwood of Imagine Entertainment produced the film alongside Amanda Marshall of Bailey’s Cold Iron Pictures. Also in 2018, Bailey teamed with Gurl.com co-founder Rebecca Odes to launch CherryPicks, a groundbreaking aggregate movie review and rating service by female critics for the female audience, which they announced at the SXSW film festival. The aggregate data service will also be useful to a wide range of studios, researchers and other data-mining customers for the purposes of determining ticket sales, box office tracking, and demographics. Bailey’s cinematic voice was first heard when her directorial debut GREENLIT – a humorous documentary examining the hypocrisy inherent in Hollywood’s “green” movement – premiered at the 2010 SXSW Film Festival to critical acclaim and was acquired by IFC International. The documentary is available on iTunes, Amazon & Hulu. Bailey’s second documentary entitled THE PATHOLOGICAL OPTIMIST which follows one of the world’s most hated & controversial people, Dr. Andrew Wakefield who lay claim to vaccines creating autism in children, was released theatrically by The Film Arcade and on VOD by Gravitas. A production powerhouse, Bailey’s Cold Iron Pictures has amassed an extensive list of critical and commercial successes including SWISS ARMY MAN starring Golden Globe-nominee Paul Dano and Daniel Radcliffe was released by A24 in July 2016. DON’T THINK TWICE, directed by Mike Birbiglia, starring Gillian Jacobs and produced with Ira Glass (This American Life) premiered July 2016. NORMAN, directed by Joseph Cedar (BEAUFORD, a Foreign Language Film Oscar nominee) in his first English-language movie, premiered at the Toronto International Film Festival and was released this past April by Sony Classics to rave reviews. Bailey’s I DO…UNTIL I DON’T directed by and starring Lake Bell and Ed Helms opened September 1. Bailey look set to continue her success in 2018, with producing projects including Rob Zombie’s RAISED EYEBROWS and Camille Perri’s THE ASSISTANTS amongst other titles she is presently developing. Kevin Parker is a Manager at Artists First (previously known as Principato-Young Entertainment). As a manager, Kevin Parker is dedicated to building his clients’ careers while focusing on their creative, business, and production endeavors in order for them to achieve their artistic goals. His client list includes names such as comedian Billy Sorrells, director and showrunner Bennet Silverman, production company Magic Lemonade, as well as writer and comedian Elna Baker. Prior to being a manager, Kevin Parker worked as a producer for networks such as MTV, CMT, VH1, and NBC and was a writer on the television series Wild ‘N Out. He got his start in the mailroom of Artists Management Group after receiving his BA in Sociology from Morehouse College. Teréz Koncz is a London based Hungarian film director, graduated with Master's Degree from the University of Theatre and Film, Arts Hungary. After working on blockbusters like Godzilla, Guardians of the Galaxy and Jungle Book for three years in London, she turned back to film directing. Her first short film after graduation ‘The Letters' has won several awards, including the Grand Prize of the Stage32 Annual Short Film Programme.